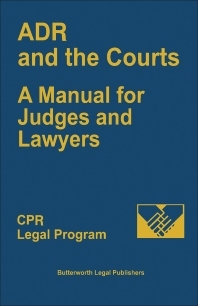 ADR and the Courts: A Manual for Judges and Lawyers focuses on new methods in the judicial system. The selection first elaborates on an overview of private ADR, semi-binding forums, and court-annexed arbitration. Discussions focus on implications for the federal district courts, effectiveness, jurisdiction, objectives, court-annexed arbitration, Michigan "Mediation" or valuation, private processes, litigation management, and dispute prevention. The text then ponders on Michigan Mediation, settlement hearings, forms for summary jury trials, and mini-trials in the District Of Massachusetts. The book tackles volunteer attorney mediation in Washington, orders and other materials from the mediation program in the United States District Court for the District Of Kansas, and orders regarding early neutral evaluation. Topics include notice of selection of case for early neutral evaluation, mechanics of mediation, format of the settlement conference, evaluation of the mediation program, and case selection. The selection is a dependable reference for lawyers and judges.